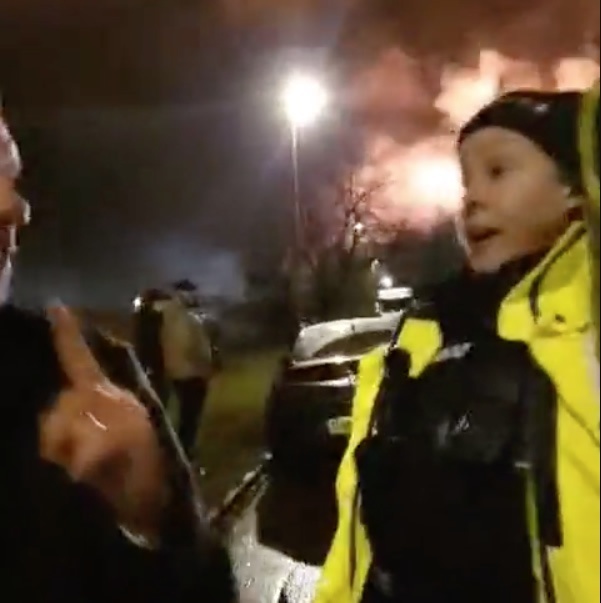 Two drunk employees from local Radio Station, Andover Radio/Love Andover obstructed police officers at the Ocado warehouse fire scene late last night (Tuesday 5th February 2019) and were threatened with arrest. Andover Radio Founder and Director David Harber and Community Development Director Mo Sweeney attended the fire in order to report on it. They were asked to move back as police attempted to place a cordon a safe distance from the growing dangerous fire so that the fire service could continue to keep the fire under control and to stop it spreading. After this, the duo appears to comply with the officers and say they understand why they are being moved, but then continue to argue with them. As the female police officer repeatedly asks them to move back, the duo can be heard to constantly bicker and question her, the officer can be heard to turn on her BWV (Body Worn Video) as the conversation progresses, she asks what news agency they work for, Harber quipped ‘Sky News’ and then after a pause said, “but I work for Andover Radio”. As Harber records the officers, Sweeney takes photos of the exchange. Several discussions between the police and the Andover Radio employees take place, at one point Harber accuses the officers of pushing him into the street. The video was shared across social media by Andover Radio Head of Opportunities Ben Tuffin, although was removed from some social media pages when it was met with criticism. Later this morning the video was removed entirely from the Love Andover/Andover Radio facebook page. Hampshire Fire and Rescue have declared the fire as a ‘major incident’ but have said that the fire is under control. Four firefighters were treated for smoke inhalation as a result of the fire. It is not yet clear what will happen to the employees of the Andover distribution centre, it is a very worrying time for everyone involved. They have apologised to Hampshire Constabulary for their behaviour in their article. Harber: You keep telling me I am obstructing you. Officer: …Because you are being obstructive probably and I hope because you are intoxicated because if you are here in a professional manner you aren’t being very professional. Sweeney: thats a fair one. Harber: Of course I can film you can’t I? Officer: I am filming you as well.. for…I’ll be putting in… even your colleague has said..
Harber: The crime I am committing is.. Officer: Obstructing a police officer in the course of their duty. Harber: I don’t think I am, I’ve got a video here of me walking backwards behind you doing what you’ve asked me to do. The fact is you are being aggressive to me. Officer: I am not being aggressive to you. Harber: Well you sort of are. Officer: I’m not going to argue with you. The live video then jumps to filming the officers putting in place police tape at a cordon before the duo are asked to move away again. Officer: Sir can you please move behind the lines. This is ridiculous, just move back please sir. You are being obstructive and you are putting everyone else’s safety at risk because we are looking after you rather than just being able to keep everyone safe. So please stop being obstructive. Its very selfish of you. A taxi is in the way of the officer being able to put the tape across the road, he identifies himself as being there to collect the Andover Radio employees. Officer: Right, In your taxi and home. Harber: Its very unlikely isn’t it? Officer to taxi driver: Can you just take them home? Officer: Sir you are being really obstructive and are putting other people’s lives at risk. You are obstructing two police officers who need to be elsewhere…off the street. Sweeney: All I am saying is we are behind the lines now.. Officer: But you have been obstructive. Just go. Just go for your own safety. Sweeney: No No I have not been… we are not staying… we are staying behind your line. you are drawing your line….we are behind the line. if this is the line we are behind it. If the lines further back we’ll go behind the line. Officer: It is going to be at the end of that road in a minute. Sweeney: you tell me where the line is. Officer: You need to be, I’ll tell you where you need to be, half a mile away. Sweeney: If you want to arrest me, arrest me. Officer: See down there, see down the end of that road? Sweeney: Thats your line here. Officer: Highways Agency are coming out and they have been posted down there. So thats where you need to go. Officer: I haven’t got the resources right now because I am dealing with you. Alright, thats the deal. Harber: Police officers are bloody rude aren’t they. Sweeney talks over the officer: My name is Maurice Sweeney. Officer: …refusing to move, just taken me ten minutes to get them to…. Sweeney interrupting the officer as she is talking on her radio: I am moving. how far do you want us to move. How far do you want me to move. I am more than happy to go to the cop shop. Sweeney: Hey Dave, got a light?